Terrible, it wasn't at all what we expected, very disappointed. The guide really believed her stories yet most of the group were just disappointed and bored... happy to walk around the area but for wasting a night doing that it could have been better spent elsewhere. This was a great tour full of wonderful historic information and lots of hair raising stories. I went back the next day to a few of the stops to check them out further. This is a really great tour. We had an excellent guide and I'm so sorry that I don't recall her name. She told great stories of the history of Hawaii. A family brought two young girls on the tour and the guide tailored some of the stories to them which was very nice. A wonderful experience and something a bit different! Lots of fun!! A great way to learn about the history of Hawaii and maybe even see a ghost! Great tour and guide. We actually saw orbs on our camera pics. Well worth it! I always enjoy a ghost tour. I learn many fascinating things about history, stories and legends. The stories about Hawaii were wonderful concerning the queen and especially the one about taking anything off the island, having bad luck and people sending back things they had taken off the island as souvenirs. The whole tour was great and our guide was very knowledgeable and had some great stories to tell. 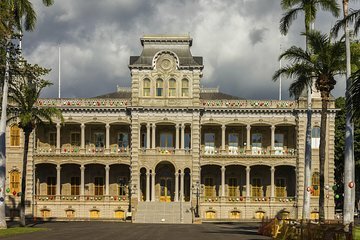 An informative guide with expert knowledge on Hawaiian Royal Family, Fire Department and the buried bodies of Small Pox victims. There is a new office building where they keep a wet floor sign for a deceased royal child. People have seen small wet footprints near the entrance.